The Porch is a gathering of 3,500+ young adults (20s and 30s) that come together on Tuesday nights in Dallas, Texas to celebrate the good news of Jesus, learn from God's Word, and leave a lasting impact on the world around them. 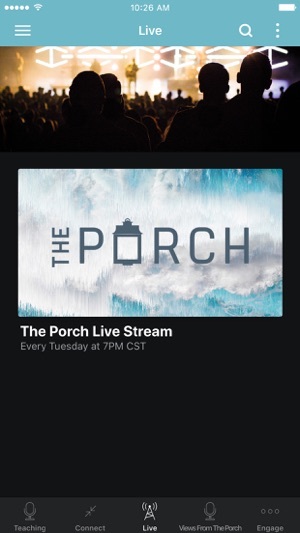 In addition to the gathering in Dallas, there are Porch Live locations across the nation. Live stream on Tuesday nights at 7 PM CST, watch recent messages, listen to podcasts, and connect with us! The Porch is a ministry of Watermark Community Church. For more information about The Porch, check out www.theporch.live. 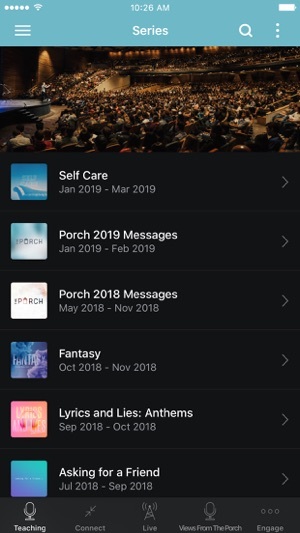 The Porch app was developed with the Subsplash App Platform. I recently discovered this app and have been listening to the messages. What an amazing gift this app is to everyone that will give it a chance. Every time I listen to one thinking it cannot get better, the next one is. They dive into topics that are so relevant to what is going on in today’s society with such love and grace. 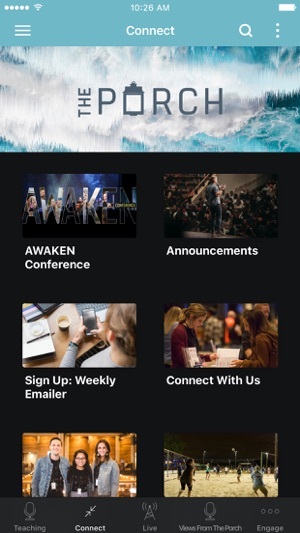 If you have not been to church or do not feel welcome to go, just give this app a chance. Listen and let these messages change your life. I love the Porch and what they do. I enjoy listening to these sermons all the time however the app needs some work. My downloaded sermons should be available offline. Currently the app won’t let me in to access them. It’s poor design. Also downloading sermons is not the most efficient process. Your material is five star material with a three star app. These sermons are really powerful and practical! Not fluffy sermons, but really meaty and deep! I also love how you can go back and forth on video and audio without losing your spot. I can also exit the app for several days and it will still be paused where I left it last time.